Hitleriffic - More fun than a barrel full of Nazis™: Time Magazine: Hitler is Man of the Year!... Oops, we mean Betrayer! 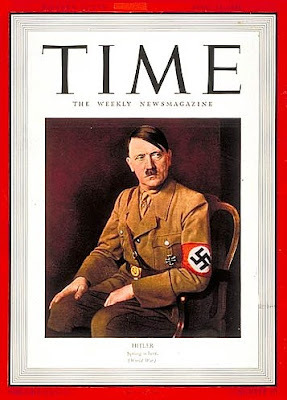 Time Magazine: Hitler is Man of the Year!... Oops, we mean Betrayer! "Civil rights and liberties have disappeared. Opposition to the Nazi regime has become tantamount to suicide or worse. Free speech and free assembly are anachronisms. The reputations of the once-vaunted German centres of learning have vanished. Education has been reduced to a National Socialist catechism." "The genius of free wills has been so stifled by the oppression of dictatorship that Germany's output of poetry, prose, music, philosophy,art has been meagre indeed." By the time he'd finally killed himself on April 30th, 1945, America had been openly at war with Germany long enough to have lost 200,000 at the hands of German soldiers. 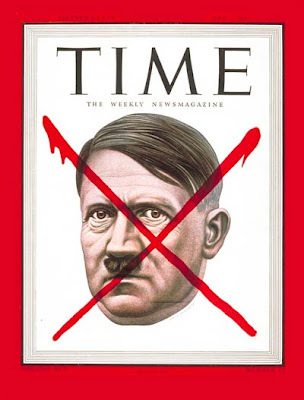 Time issued a different cover for that story: Hitler's face with a blood-red X across it and a title "The Betrayer." No dichotomy between the title and the text here. The test drips with hatred for Germany and Hitler. "Judging by present appearances, it does not seem likely that Adolf Hitler will go down in German history as a martyred leader. . . . Hitler, if he were still able to wonder what his historical function had been as everything crumbled, might say with Mephistopheles in Goethe's Faust: I am Ein Teil -von jener Kraft, Die stets das Base will und stets das Gute schafft. (Part of that force, That is forever willing evil, continually produces good.)"